Recently I attended Ericsson’s Industry Analyst Day in Boston where Ericsson’s leaders updated the analyst community on the state of the company both globally and in North America. They also deep dived into the network evolution to 5G, AI, Automated Operations,5G and IoT Industry Innovation. With my focus on IoT, I was keen to hear what was new in IoT platforms, cellular connectivity, secure IoT 5G services, and Industry 4.0 use cases. As part of the very public turnaround plan, Helena Norrman, Ericsson’s SVP and Chief Marketing and Communications Officer and Head of Marketing and Corporate Relations announced the following: Ericsson’s focused strategy continue to be based on a vision to empower an intelligent, sustainable connected world while enabling the full value of connectivity for service providers. Results of the strategy included accelerated cost cut – which was on plan to reduce expenses by 10 Billion Swedish Kroners (SEK), with an improved cash position by over 11 Billion SEK. While not out of the woods yet, it appeared that the renewed focus on business efficiency, improved end-customer experience and new revenue streams has given Ericsson a level of optimism that hasn’t been seen for at least 4 years. For example, Norrman shared that Ericsson’s networks had become 50% more efficient in energy consumption on footprint and operations optimization. She indicated that new digital services were being rolled out 86% faster than before. Finally, she indicated that Ericsson had achieved 201% RoI in the first year for an IoT-based factory maintenance system. In his update, Niklas Heuveldop, President and Head of Ericsson North America, suggested that there might be continued changes for the big 4 US-based telecom operators. With a background of a six-fold increase in mobile data, mobile revenue remains flat, blended ARPUs declining, and cellular connections (including IoT) growing by 4.4% from 398 million 3Q-2016 to 434 million 2Q-2018, he indicated that operators would have to look for new revenue streams to stay profitable. This was on top of a new operator market that may change structurally as a result of the T-Mobile/Sprint merger (offering a broad range of spectrum for both consumer and enterprise customers), and the arrival of new wireless network operators. The day was dominated with the business opportunities based off 5G networks, as Ericsson continues to look to expand the addressable markets by enabling new revenue streams. For example the combined Critical and Massive IoT markets based off 5G networks could range between $200 – $600 Billion as part of scale driven and performance driven opportunities in markets such as Industry 4.0. Use a lean startup approach to validate and scale ideas. 5G and IoT have been pushed by the major operators for some time and the industry has been holding its breath as vendor after vendor attempts to craft a profitable business strategy and identify use cases that deliver an acceptable RoI. Most have not yet either reached scale because of the lack of readiness of the whole ICT infrastructure once IoT devices are connected. Too much emphasis has been placed on too few IoT applications at the edge of the network. Too much hope has been placed on Edge Computing without meeting customers’ needs of an end-to-end solution. 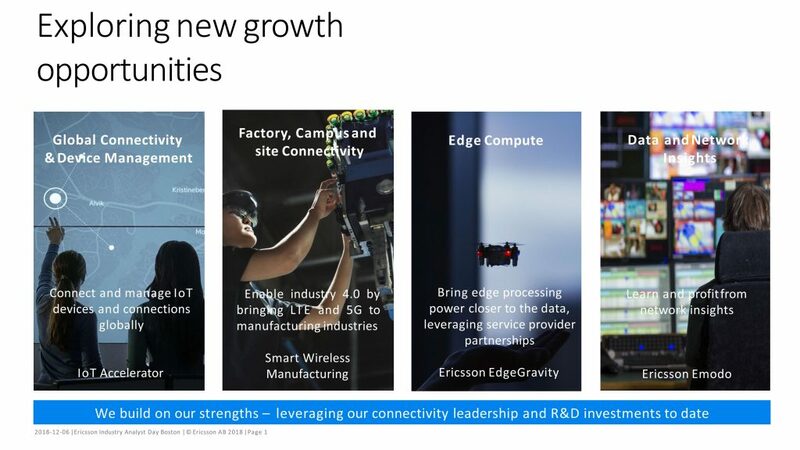 However, we belief that Ericsson’s clear focus on connecting IoT devices, while maximizing the edge computing needs through local analytics while enabling operators to partners with cloud service providers will open up vertical industries such as manufacturing to IoT deployments. Ericsson’s solution for wireless capabilities within Industry 4.0 could be readily accepted by customers who want to transform themselves to digital-based businesses.